Though it is being said that measuring the exact social media ROI is not that super-accurately possible, yet the social media monitoring is really important to be included into every social media strategy one employs. How Does the Use of Social Media Monitoring Tools Fit into the Scene? Depending upon the organizational structure and the social media policies in practice (within an organization), the employment techniques and the types of social media measuring/analytical tools used may vary. But the basic requirement of such measuring tools would always remain the same; and that is the sole reason that we experience so many varieties of social media monitoring and analytical tools for almost each & every social media platform. Among all these, the tools compatible to twitter outnumber the tools made for other platforms. Only the paid versions of monitoring and analytical tools like Radian6, Alterian, Sysomos, Socialbaker, Raven, Socialmetrix, Spiral16, PageLever etc. provide services in all the social media platforms as per their own policies. Why Do We Need Facebook Monitoring tools? Planning a proper social media analytics monitoring would not be complete without the Facebook factor into it. The user-base of more than 750 million people worldwide places Facebook on the top of the list of all the social platforms to monitor, whether you agree or not. Facebook pages being the sweetest candy of the social engagement, most of the greatest (and almost every FB measuring/monitoring) tool is centered on the product FB pages. Despite being the fact that Facebook insight itself is the greatest free monitoring or tracking tool ever, everyone goes for the stuffs/tools that can simplify the Facebook process of monitoring and/or tracking by a step further. 1. 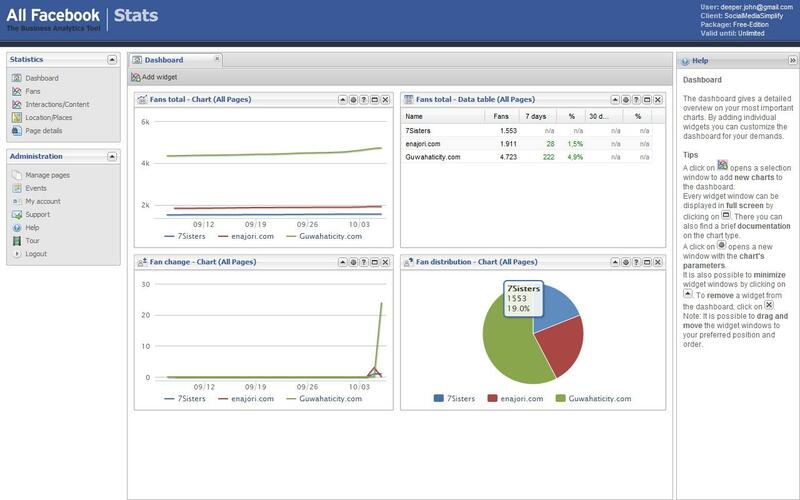 Facebook Insights: The grand grandfather of all FB monitoring tools is itself from Facebook. Yes, it is the Facebook insights. Though Facebook at its initial stage introduced LEXICON – the Facebook product meant specifically for trend mapping, later it was being removed to strengthen the insights related to pages, ads and apps. FB insights for pages with its three tabs power the user to monitor everything ranging from demographic distribution to the daily level of interaction in that particular page. And the insights for Ads and the apps also come with the specifications they are meant for. 2. 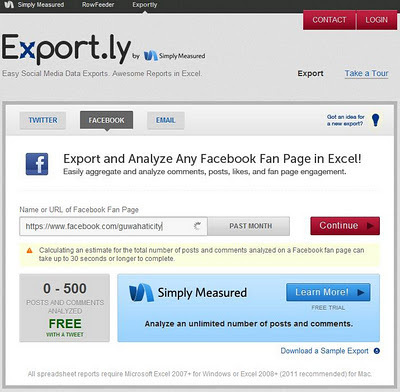 Export.ly: Another great free (better say freemium) tool I have come across is Export.ly from ‘Simply Measured’. One can easily get the Facebook competitive data in a Microsoft Excel format. 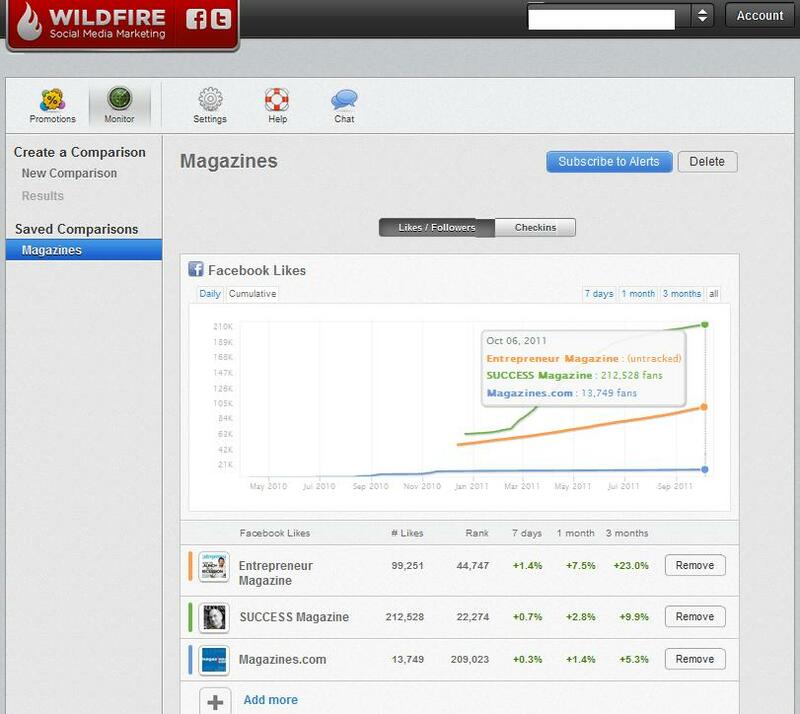 The free version can generate reports containing 2 weeks of data for pages with up to 250K likes. And beyond that limit… you know what a freemium policy is! 3. 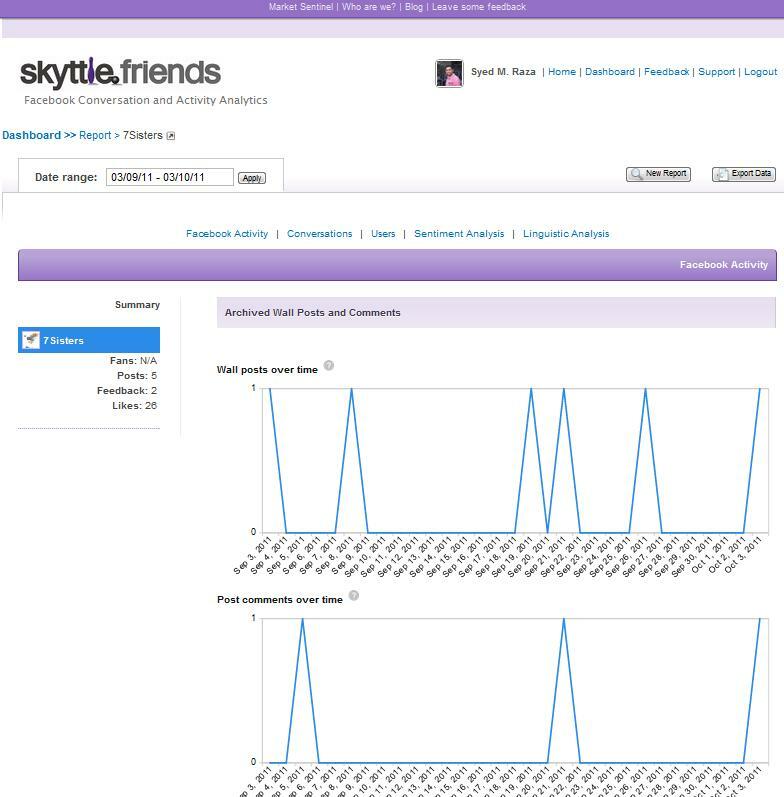 Friends.Skyttle.com: It is a great free tool to monitor the conversation and activities in any of the FB products like a page, a group or an individual account etc. Along with conversation and activity, this tool also provides great data on users, sentiment analysis and linguistic analysis. Though the graphical data presentation is not that cool as in paid social media monitoring tools like Radian 6, Alterain, Symosos etc. 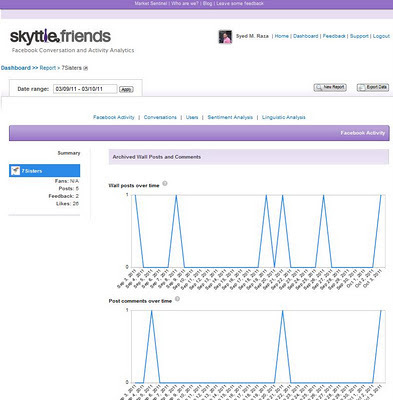 yet one can easily understand the layout Friends.Skyttle presents. 4. AllFacebookstats.com: Allfacebookstats is a particular Facebook page tracking and monitoring service. With this great tool, one can measure the 3 things in Facebook i.e. – fans, interaction and the contents. The advantage of managing as many pages as you want (under the paid version only) is something quite good to experience. The free version of allfacebookstats restricts you to manage only 3 pages at a time. The next best thing that comes handy to a minute analyser like me is the availability of the function where you can monitor almost any page even without having the admin powers to your profile. One can compare the LIKEs, ranks and growth (daily, weekly & monthly) of 10 Facebook pages together under this free version from Wildfire. 6. HyperAlert: As the name suggests, HyperAlert is a kind of alert service via mail. If you really get very less time to monitor your page/s or roam around with a PDA or smart handheld, then HyperAlert is the service that can keep you abreast. It’s the service that provides email reports of updates, posts & comments on a Facebook page. In case you are looking for a service that alerts you instantly then HyperAlert is not the best service or monitoring tool for you as their delivery is quite a slow process. 7. OpenBook: At a particular stage of usage, you would find almost the entire range of social search based tools quite boring and unproductive. In such a stage, and also for a great Facebook monitoring experience, I personally prefer using this tool called OpenBook. OpenBook lets you search all the public updates in Facebook itself that is quite impossible while you are using the simple Facebook search. And the beauty of this tool lies in the simplicity of use it comes with. To search on openbook.com you don’t even need a Facebook account. The developers behind this openbook have developed this awesome Facebook search based monitoring tool out of the Facebook free APIs available publicly. If you have come across any Facebook monitoring and/or analytical tool that you think is awesome, please do let us know in comments or in your tweets (mentioning @SyedmRaza). Have some awesome analytically oriented Facebook results ahead. 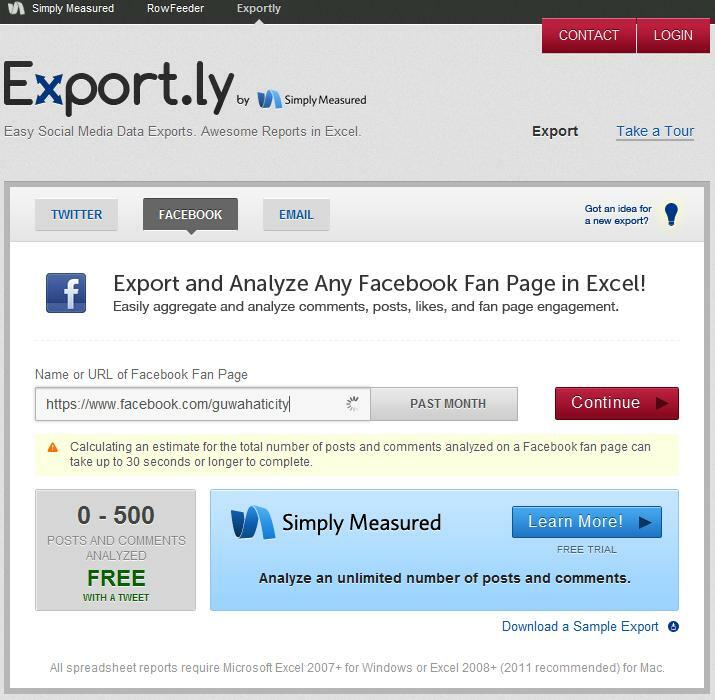 As per the recent updates from Simply Measured, "Export.ly" services have been retired. Try Actionly for affordable option to Social Media Monitoring. We have recently integrated with Google analytics and track your Social Media ROI. And also offer White labeling. Actionly offers White labeling, Brand tracking across Twitter, Facebook, Blogs, Flickr, YouTube etc and also allow managing multiple Twitter or Facebook accounts from our dashboard. Just experienced your Free Trial. Must say the "Tag Cloud" is great. Hope to see you rising with a skimming pricing policy. YourOpenbook or OpenBook has been shut down recently!